May 30th 2013 – Agaricus osecanus is very closely related to the Horse Mushroom, Agaricus arvensis, yet it differs in a number of ways. 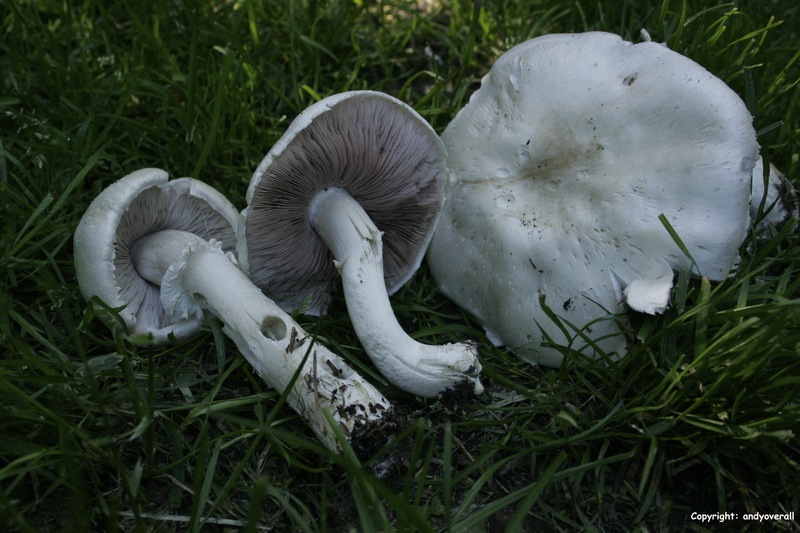 It has slightly smaller spores, it tends to occur during late spring early summer, prefers to be close to trees and crucially it is whiter and remains so, with hardly any yellowing, unlike the Horse Mushroom which yellows more readily, both have the cog-wheel patterned partial veil and annulus (ring on stem). The definition of A. osecanus syn. A. nivescens is ‘Snowy Cap’. Quite clearly shown in the picture below. Note the pale gills of the more immature specimen, far left as you view.